Che de Milan is about to embark on an adventure of grand proportions . . . whether she wants to or not. In life, Che’s mother Diana was eccentric, experimental, and radical; in death, she still is. After being diagnosed with cancer, Diana returned to her roots and rediscovered religion. Her greatest desire is to make the pilgrimage to Canterbury, following the same path as Chaucer’s pilgrims. Che promises to accompany her mother as soon as she feels better. But Che’s mother does not get better, and three weeks following the funeral, Che receives her mother’s ashes and a reminder of the promise she made to take her mother to Canterbury. As she tries to figure out how to honor her mother’s wishes and avoid traveling to England, Che receives another letter. This one is from her long-distance, long-term boyfriend who informs her that he is breaking up because he believes he has found “the one.” To escape dealing with Ned, Che books a private guide and heads to London. Luck, however, is not with Che. Her tour guide has to undergo emergency surgery; fortunately, she was able to get Che in with a group of women called “Broads Abroad.” As an only child, Che is uncomfortable with the idea of bonding with the group but becomes dependent on them when she loses her cell phone. And so, the pilgrimage to Canterbury begins. Tess, their fearless guide, leads the women on a six-day trek. Che is joined by Steffi, the athlete who tries to maintain a healthy routine on the trek; mother and daughter Jean and Becca, trying to forge strength in their relationship to last the teenage years; Angelique, a BRAVO Housewives of Jersey star; Claire and Silvia, two good friends with six husbands between them; and Valerie, the quiet one. To help pass the time and be true to Chaucer’s original story, each woman takes a turn on the trek to tell a story about true love. 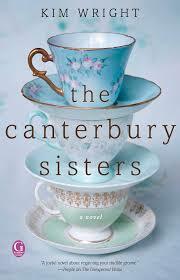 Tess will determine the winner of the story-telling once they reach Canterbury. As the stories are told, it becomes clear that the pilgrimage to Canterbury is much more than just a journey for the body and soul. It is a quest for understanding, peace, acceptance, and love. I discovered this book by reading about it on a blog! A shout out to my friend April’s blog on SmartGirlsRead. You can check out her review here: Smart Girls Read Review. The book title attracted me immediately. As you might have guessed, I am a complete nerd. One of my favorite pieces of literature to read and teach was Chaucer’s The Canterbury Tales. His grave was top on my list of places to see in Westminster Abbey and the pilgrimage to Canterbury is definitely on my bucket list. I remember first reading it as a junior in high school. Mrs. Rein had us memorize the first eighteen lines of the Prologue in Middle English and I can still do it today! That is how I get through my workouts; I mentally recite those lines to distract me from my body’s pain! I love the idea of taking a pilgrimage; in a lot of ways it is like a family vacation. Often the journey is so much more meaningful than the actual destination. The stories that the women tell are very personal; I enjoyed how the author used the stories to not only give depth to each individual character but developed the personalities of the other characters through their reactions. Definitely a great book for a women’s book club; the discussion questions at the end of the novel are actually pretty good and would provide a great guide for lively dialogue. The book has inspired me to push Chaucer’s pilgrimage closer to the top of my bucket list. This entry was posted in Individual Books and tagged Canterbury, Chaucer, Kim Wright, pilgrimage, story-telling, The Canterbury Sisters, women on September 6, 2016 by kvgaughan.